Parenting is probably the hardest job out there, but it can really provide us with innumerable lessons for growth. I recently read a post called What if We Gave Them the Benefit of the Doubt? It was a post about a parent going right to blame when a child spilled an expensive bag of fruit all over the floor so it became unusable. Instead of finding amusement about the situation or listening to her child’s version that it was an accident, the parent went right to blame. And, she’s not alone. Many parents–heck, many people–instead of seeing/hearing things from another’s perspective, jump right into “I’m right, you’re wrong.” This leads to frustration and anger–which can be repressed, suppressed, and denied–in the other person because they feel misunderstood and misjudged. In the post, I like the way the writer reflected on her behavior and used it as an opportunity to learn from this experience. Many people’s defaults are set at going right to blaming another, instead of allowing themselves to consider there is another perspective to the situation. These assumptions lead to all kinds of things like distance in a relationship, frustration, withdrawal, suppression of a person’s feelings, etc. I believe that people are doing the best they can in every given moment. If they could do better, they would. Even those adult temper tantrums–they’re ungrounded in the moment, and if they could do better, they would. 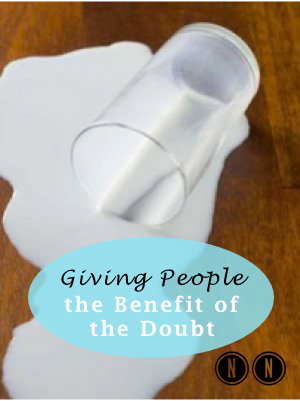 Giving people the benefit of the doubt is really about trust. Are you a trusting person? It’s likely your expectations are that others will be too. I have always erred on the side of giving people the benefit of the doubt–sometimes to my detriment. My divorce is a good example of this. I don’t want to get into details, but my naiveté about my ex caused me great pain, disillusion, and later frustration and anger at what happened. But, on the flip side my expectations of people doing the “right” thing has provided me with innumerable life lessons. One of the byproducts of my naiveté has been learning to express the anger and frustration that naturally come up. I grew up fearful of expressing anger so during much of my adult life, it sat below the surface and became at one point, depression. I learned it wasn’t safe to express anger, so I kept it down. When you give people the benefit of the doubt and they betray your trust, it’s a natural human reaction to feel anger about that (what isn’t good for you is holding on to that anger). Expressing anger at the right person at the right time is a valuable skill to have in life. One downfall of giving people the benefit of the doubt is believing they’ll change the next time. But they don’t. I think it was Maya Angelou who said, “When people show you who they are, believe them the first time.” I do believe people can change, but some don’t. Watch their behavior, not what they say. Actions speak so much louder than words. Also, there are people who are not nice, who are mean-spirited, or selfish, or evil. But, I find this is the exception, not the rule. I think parents, like the one who wrote the post, deal with a lot of situations that try their patience. They’re overtired, their kids are overtired, and they just snap sometimes. That’s human. What’s nice is that it provides an opportunity to show your child how to apologize for your behavior and also to reflect on how you can do things better the next time. I like being naive. I am drawn to movies like “Elf,” “Legally Blond,” and other movies that depict characters that are naturally optimistic and naive. They haven’t shut down, they are open to new experiences and people with a positive attitude. I think that’s a great way to be in life. I believe in giving people the benefit of the doubt. I believe people are inherently good. This doesn’t make me “right” or “wrong” by the way–it’s just one way to live your life–a way that I think enhances my life. This woman’s child may have ruined an expensive bag of fruit, but the child provided her parents with a learning opportunity–and that’s priceless! Kids may make “mistakes,” but it doesn’t have to be so serious–everything can be a seen from the perspective of a learning opportunity. Everything is a chance to show your children how to behave as an adult–a responsible, mature, well-meaning, supportive, and loving adult.